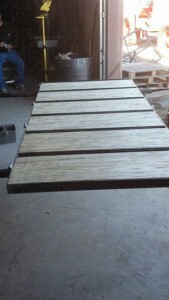 In this addition of our monthly write ups, we take you through the construction of a door project. On the surface, this may seem like a relatively elementary project, but as you will notice, the attention to detail is what makes this “door project” so much more advanced than what most general contractors perform. One of the things that separate us from general contractors, which many of our clients and architects note us for, is our ability to exceed expectations with architectural construction projects. For example, on one of our construction projects, we took on the task to build a door from scratch. 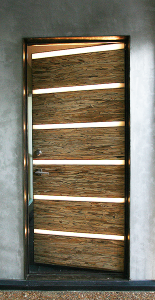 However, this was not an ordinary door but a beautifully designed creation with integrated LED lights and solid wood inserts. This door ended up being the king of all doors – a door that defined class and elegance while presenting a gateway into the owner’s dream home and vision. 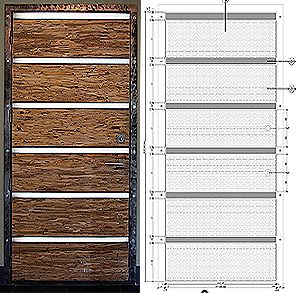 To create this piece of art, we first carefully examined and studied an Autocad drawing of the door. Next, we had a structural welder put together a frame for our door with strict guidance and observation. The frame was built to exact measurements given on the Autocad drawings as well as where the welds need to be and how much heat penetration was required for each spot. This process ensures the specifications are met to perfection. We then proceed to the next phase which was ordering our parallam beam and having it cut and trimmed to proper specification (parallam beam is structural composite lumber SCL and is difficult to cut and very hard to mill which is why most wood shops will not mill this type of wood). 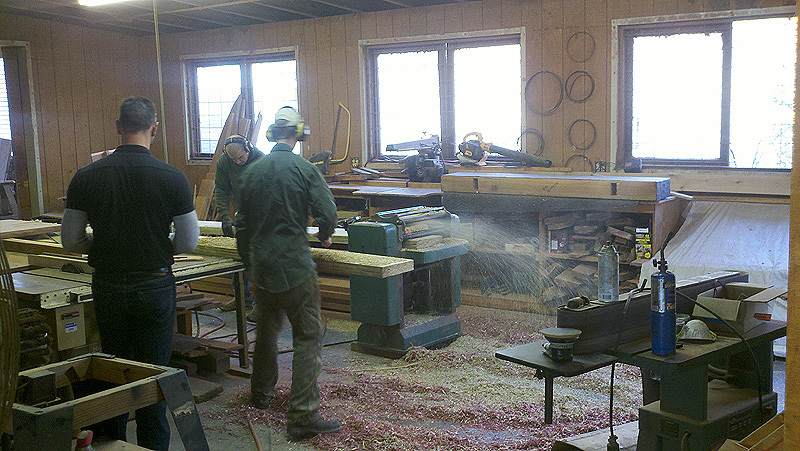 The beam came to us as one long rough piece so we cut and milled the wood to exact dimension. Our quality control efforts guarantee there are no imperfections. Normally, most contractors would not attempt this task because of the amount of skill, patience, and strategy required to perform such an act, but Doug and I have excellent skills and expertise to do this and we love it! These types of challenges are what motivate us. The science behind what we do is what sets us apart. After we had the wood properly trimmed and cut, we then carefully re-trimmed/shaved the wood pieces ourselves so that insertion of the blocks into the steel door frame would be perfect. 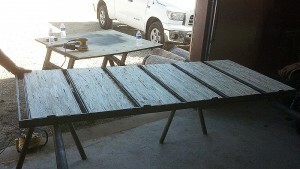 This process was a little time consuming because each block of wood was slightly different from the rest. However, with careful skimming and sanding, all the blocks fit beautifully and were in sync. After the door was assembled, we moved the door to the project site. This took some time because the door was extremely heavy. Installing the door was not easy because of all the slight adjustments we had to make as well as being careful for wiring the LEDs. We used special screws to hold the wood in the door frame and created a channel for the LEDs as well as the special cut glass. Since Doug and I knew the intricacies of the door structure and design, we closely guided the electrician on how, where and what the wires need to be on the door and frame. Once the wiring was out of the door, then it was easy for the electrician to connect the wire to a hidden transformer. All in all, the job was exciting and detail oriented. We submerged ourselves into the project so that we knew every inch of the door and didn’t rely on the word or measurements of someone else. The project was hard work, but if it was easy, then everyone would be able to do it. We want our clients and architects toughest project knowing we live for the challenge, and we look forward to the satisfaction we create. This entry was posted in Architecture and tagged architect, architectural, custom, design, door, fabrication, home, led, metal, residential, wood. Bookmark the permalink.